This is a new nanoscale device that can detect RF. You put in a bias current between D and S, it goes through the graphene (sheet of 1 atom thick carbon). The graphene sheet resonates mechanically at an RF frequency (33 MHz in the reported device) when a signal is coupled in capacitively from the gate. The vibration induces a signal on top of the D-S current. The device works at 77 K (liquid nitrogen temperature), but hopefully can be developed for room temperature operation. Google's new service "Ngram" is cool. It lets you search for any word or phrase through all the books Google has indexed, displaying the count versus year. The significance? 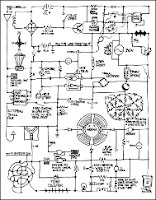 Ham radio (in books) didn't start until about 1950! The Ngram view page also gives links for the books in particular year ranges. I looked up some of them prior to 1965 and found lots that were in the "popular" category: Popular Mechanics, Popular Science, Boy's Life, etc. Amateur radio, however, has a book record back to 1900 if not before. I checked in this afternoon just to see, and by golly there were openings to the south (FL - Caribbean - Brazil) and to the west (XE and W6). Along with some local folks. I ended up with 16 mighty Q's and 13 multipliers. And I resisted the temptation to use the afterburner! Ten meters is a low-power band, right? Now, I'm a believer in gray-line propagation. 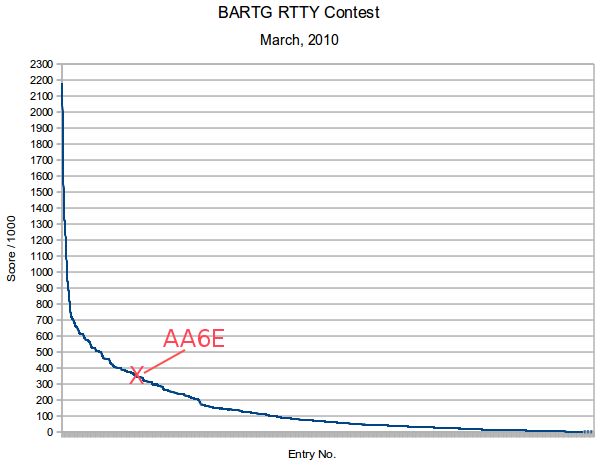 The amprnet allocation usage must be tiny in percentage terms, and hard to justify in a world of address scarcity. Standalone radio networks based on TCP/IP (if there really are any!) 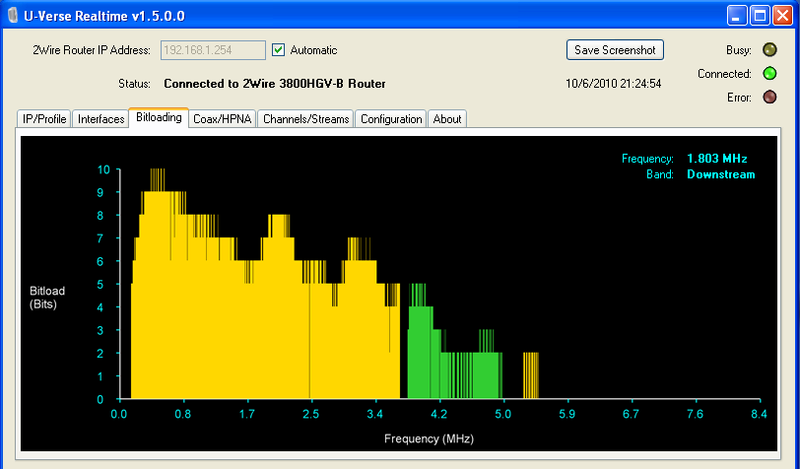 are likely based on VHF if not 2.4 GHz (HSMM), and they are fundamentally local or regional and are not likely to be routable from the Internet. They could probably equally well use a network address like 10.0.0.0/8. In recent years, various other network-based amateur systems have developed, including EchoLink, IRLP, D-Star, winLink, etc. These make effective use of Internet links, but have no particular need for the amprnet addresses. I don't want to argue the pros and cons so much as to point to the odd situation of our hobby holding such a valuable resource, with no visible institutional support. What are the chances to get a little more RF spectrum, if we hand back the IP addresses? The AT&T installer had not fully appreciated my phone entrance system, which uses a special DSL surge suppressor that is bolted onto my Single-Point Ground system. He ran his CAT5 cable from the wall plate straight into the RG. (That's OK for RFI, but not great for lightning surges.) The house phones were fed via a circuitous route passing (backwards!) through the surge supressor, and generally making a nice RF pickup loop. This afternoon, I pulled out half my station (the heavy part!) so I could get access, and rewired the phone system, adding ferrite chokes, etc. Result: no trouble now with 800 W at 3600 kHz. I'll do more tests later, when the contest goes away. More complete info will be at http://aa6e.net/wiki/RF_Compatibility. Design in your browser. An integrated web-based schematic capture and breadboard support system provided by Music from Outer Space. It's oriented toward audio, not RF, but it's a cool site for simple designs. My Sony VAIO (VGN-FS710/W) gave up the ghost last month. The screen went dark, and it emitted some screechy noises. I figured what a hardware service call would likely cost, and I decided I quickly needed a new laptop to support my work at ARRL and other things. So I sprang for a new inexpensive Toshiba (Satellite L6460), which did not cost much more than that hypothetical service call. Now, after my computing situation has stabilized, I had a chance to open up the VAIO to see what could be done. There were some helpful disassembly hints on the Internet, and they were essential to avoid breaking things. The culprit almost leaped out at me. It's the tiny inverter card (above) that makes high voltage to run the fluorescent LCD back light. The Internet (again) seems to be saying this is a frequent source of problems. The HV rectifier was charred and broken, so obviously this was the problem. It's a $50 part, and I hope replacing it will solve the problem. I suppose there's a moral here. I could have saved money, but incurred opportunity cost and risk, if I simply repaired the VAIO. I'm happy to have a new, more powerful laptop. Still, the VAIO is handy because it has some critical features (like Firewire) that make it very useful for some of my work. Update (11/12/2010): Thanks to lcdparts.net, I have a new inverter, and the VAIO is back in operation! As noted in the prior post, we are switching to AT&T Uverse. Formerly, we had Comcast cable for TV, AT&T DSL (6 Mb/s) for Internet, and plain old telephone service (POTS) from AT&T. Now we get all 3 services from Uverse - the so-called triple play. Voice is now VOIP carried over the underlying DSL technology. Preliminary observations: Everything works. That's very good - much better than our early struggle with DSL. We get a real 11+ Mb/s of data download. TV works, but somehow the order was bungled and we do not have HD service yet. A little worrying, the picture on SD TV is rather softer than we had with Comcast. That probably reflects excessive compression by AT&T. I wonder how much better HD will be. Phone service by VOIP works nominally, but now we rely on a UPS to keep service up in a power failure. POTS emergency service was much superior! The level of system integration and the TV user interface is much better than what we had before. Of course, Comcast also offers the triple play, but their HD video recorder system (and its control options) was inferior. AT&T's services available through the TV are very interesting - receiving your phone voicemail? I haven't tried that yet. The industry has still not solved the command and control problem for home entertainment systems. Even with the new system, we are in remote control hell if we ever want to use our DVD or other add-ons. This is particularly frustrating for the less technical members of the household! Why this could not have been resolved by now with some kind of standardized control bus among "home theatre" devices is not clear to me. No one seems to take this major consumer interest very seriously. Stand by for occasional further reports. Update: A few worrisome but non-fatal issues emerging. Uverse VOIP service gives too many "fast busy" signals when calling some "well known" local numbers -- and even when calling Uverse support! You would think "the phone company" would understand phone technology, even if it's VOIP. This is a problem that almost never happened with the POTS network. On the TV side, accessing some Uverse help files (apparently a TCP/IP web transaction?) return a 404 Page Not Found screen, which should never happen. A while later, the request worked correctly. I've been enjoying stable "Elite" DSL service (6 Mb/s download) for about 5 years now. Time to update to AT&T's "Uverse" service? It just arrived in my neighborhood. Surely, AT&T would have figured out their new Uverse TV/Internet/Voice technology by now. Nothing can go wrong, go wrong, go wrong. Actually, they've made 3 errors so far just scheduling the installation, and I've had to talk to 4 or 5 people on the phone. The interesting technical issue is that their internal database shows that I am supposed to be 733 feet from the "node" (VRAD) in my neighborhood. But, tracking real phone cables, I come up with some long zigs and zags that may add up to triple that number. So there's a chance the tech will show up (at the newly appointed hour, we hope) and declare that my connection would be substandard. And the whole thing is off. I'm not canceling my Comcast TV just yet. 5 Amateur or GMRS applicant/licensee certifies that the construction of the station would NOT be an action which is likely to have a significant environmental effect (see the Commission's rules 47 CFR Sections 1.1301-1.1319 and Section 97.13(a) rules (available at web site http://wireless.fcc.gov/rules.html). 6 Amateur applicant/licensee certifies that they have READ and WILL COMPLY WITH Section 97.13(c) of the Commission's rules (available at web site http://wireless.fcc.gov/rules.html) regarding RADIOFREQUENCY (RF) RADIATION SAFETY and the amateur service section of OST/OET Bulletin Number 65 (available at web site http://www.fcc.gov/oet/info/documents/bulletins/). Then there is the ARRL book "RF Exposure and You" by Ed Hare. ($22.95 from ARRL or $9 used at Amazon.com) That's on my shelf, as it happens. Now I better crack it open. Silly me, I thought applying for and receiving an FCC license meant you agreed to follow the rules. But no, I have to promise extra hard and agree to read all this in advance. Glad to know every other ham has done that! 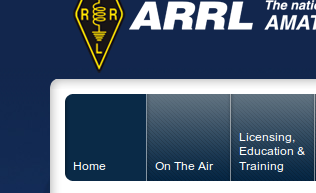 I note that ARRL now has "five pillars", recently up from four. But wait, there are five pillars of Islam, too. Some forms of Buddhism have ten pillars. So what's this about "pillars"? 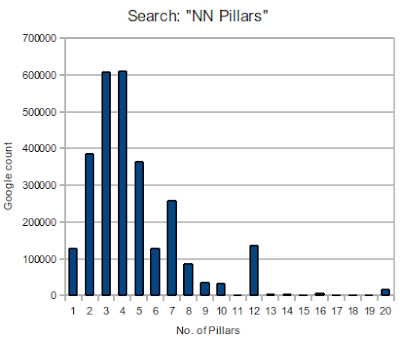 Inquiring minds want to know how many pillars are optimum. We consult the oracle - Google - with a request to find all occurrences of "N pillars" - from "One pillar" to "twenty pillars". The following is the result -- worthy of deep contemplation. One of the neatest displays at ARRL headquarters is in the W1AW station entry -- a couple of early radios using the DeForest Audion. You have to know where to look for them. The League is many things, but it lacks a real museum curator. Are you into software development, Ubuntu Linux, Amateur Radio? 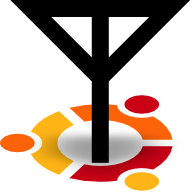 Then you need to know about Ubuntu Hams! Some words bother me. Maybe I'm showing my age, I know. But consider. Wattage - The better word is "power" or "power rating". A 60 Watt light bulb has a 60 Watt power rating. A 10 Watt bulb is a low power bulb. On the other hand, "wattage" is a parallel of "voltage", and I don't have the same reaction to that word. The "correct" words would be "potential" or "electromotive force". Then why don't we say "amperage", "ohmage", "faradage", or "henryage"? 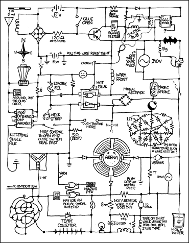 Actually, I do hear "amperage", but not commonly. That's all for now from your local curmudgeon shop. I'm working with the Quicksilver QS1R receiver, a little SDR box that samples the spectrum from 10 kHz to 60 MHz. 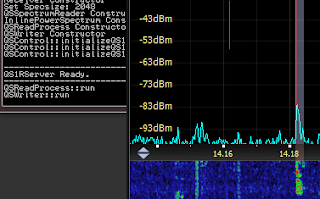 The hardware seems good, but most of the action for the user is in the "S" part of SDR -- i.e., the software. Take a look at 20 meters in the afternoon - with all possible windows open. (To be fair, you don't need twin monitors -- 3840 x 1080 pixels -- to use this radio!) CPU demand is 6% on my 4 core, 8 thread system, Windows 7 (64 bit). Click for higher rez. AA6E just acquired a new small rig, a Yaesu FT-897D. Small on the outside (size), but big on the inside (features) -- like Dr. Who's Tardis. This is the first Yaesu HF (+ VHF/UHF) transceiver I have used since the days of the sainted FT-101. A limitation of all compact rigs with sophisticated operating modes is the very limited user interface (knobs and buttons) through which you have to configure the equipment. We have a smallish LCD screen, 14 buttons, and 4 knobs -- and something like 100 parameters that can be set. I am climbing the learning curve now. So far, it appears that the "information design" is fairly rational and easy to deal with, conquering new features one at a time. It will take a while to know the rig thoroughly. I'm only afraid I'll forget faster than I'll learn - especially since this is meant as a secondary rig for me. Getting on the air? I tried for a while without success. I was transmitting at 18 MHz into my 80 m dipole -- not a good strategy. Switching in the SteppIR, I made quick contacts with HA8, F5 and Texas for good measure. Nice reports. Note to self: Improve antenna switching system! Amateur Radio in German is "Amateurfunk". That sounds pretty funny to an American ear, since "funk" is a highly-charged word with several meanings, none of them suggesting a radio hobby! Somehow, through the Internet, I came across the word "der Funke" meaning "spark". And the clouds parted. Radio as spark. That was certainly its origin in the late 1800's. Amateur Spark is a nice thought, now rather anachronistic, but saying something about what makes ham radio what it is. The prefix radio- in the sense of wireless transmission, was first recorded in the word radioconductor, coined by the French physicist Édouard Branly in 1897 and based on the verb to radiate (in Latin "radius" means "spoke of a wheel, beam of light, ray"). "Radio" as a noun is said to have been coined by the advertising expert Waldo Warren (White 1944). This word also appears in a 1907 article by Lee De Forest, was adopted by the United States Navy in 1912 and became common by the time of the first commercial broadcasts in the United States in the 1920s. Note added: Here's what set off my spiel today, an Economist article quoted by Andrew Sullivan here. The brand new long-in-coming ARRL website is up! It is at www.arrl.org, naturally. I had a tiny role in preparing some of the pages. Hopefully you will not see my fingerprints anywhere. It looks pretty good to me, and we can only expect it to improve. Anyway I found the first Callbook instances of my 4 callsigns: K5MXF (1958), WA1OCT (1971), WB6YBQ (1974), and AA6E (1979). Like many old timer hams, I did not keep my early license documents and my memory of exact dates was fuzzy. It's good to have them now. The League has a great archive, but alas there is no one tasked to retrieve data for members. It might make a good service job for the right volunteer in the Newington area. Note added: If you try hamcall.net for historical data, you need to be registered (free) and logged in. Go to http://hamcall.net/call, enter the call sign and check the box "Look up this callsign from all available database years". One of the features of having a volunteer gig at ARRL in Newington, CT, is getting to drop in at this store. To my mind, it's what Radio Shack should have been - a great place to browse for doo-dads for the next building project. What stopped me in the aisle was an item hanging on the rack - An "11-pin octal socket". A weird concept, that. You can search for them, too. I also find a listing for 4-pin octals. Note added: Latin lovers and computer geeks will realize that "octal" means eight. See Wikipedia on tube sockets. I find sockets named "Septar" (7 pin), "Noval" (9 pin), "Decal" (10), and "Duodecal" (12). There was a brief time when engineers still knew some Latin! Now, an 11-pin octal doesn't raise an eyebrow. A nice note from Tobias, DH1TW, got me in touch with his fascinating blog "Contesting & SDR". 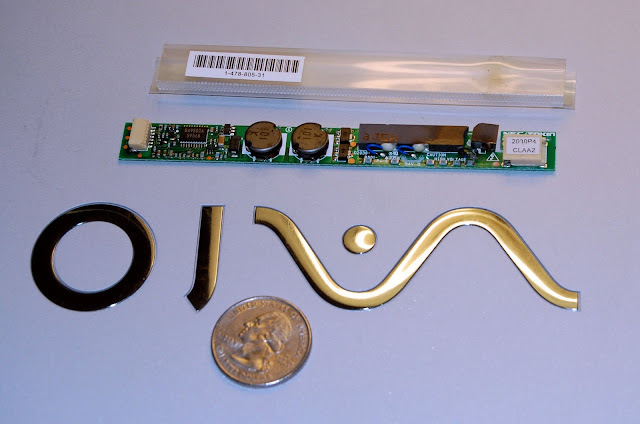 As luck would have it, he has a nice set of reviews of a forthcoming SDR kit, the FA-SDR-TRX designed by Harald, DL2EWN, and published in 3 issues of the German magazine "Funkamateur", Oct. - Dec., 2009. The kit is supposed to be coming in March. I can't wait. It may relieve my frustration. I finally got around to building the SoftRock RXTX 6.2 kit that I've had sitting on the bench for nearly two years. This was stimulated by some progress on the audio front. After a number of tries, my Edirol FA-66 audio subsystem is working with Ubuntu Karmic Koala. In the past, I've run into issues with the questionable support for Firewire devices in Linux. Finally, I figured out enough about how to use the Jack audio connection kit and the FFADO/FreeBob Firewire driver to make things work. (I wouldn't say I understand Linux audio, though!) The FA-66 offers up to 24 bit sampling at 192 kHz, which should cover a substantial part of most of the HF Amateur bands. So I need a front-end like the simple SoftRock boards to act as both receiver and transmitter. The RXTX 6.2 was going be the one. I built the nice switched dual crystal oscillator board for 20 and 30 M operation, and then was ready to tackle the main board. Alas, the main PC board is missing! Either it never came with the kit, or it got mislaid back in 2008. Now what to do? DH1TW sent a note that suggests an answer. See next post! The 24.9 MHz band was popping this morning. Worked SV3 (Greece) and YV1 (Venezuela) for fun. Solar activity is helping a lot. A great local newspaper piece on Amateur Radio, Haiti support, and Harold Kramer, WJ1B. Check out the video, too. Do you know about AMPRnet? 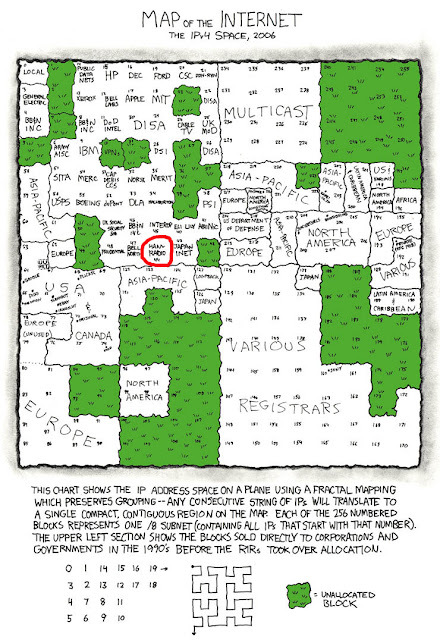 I've wondered about this mythical network off and on since the 1980's packet boom. Back then, I was doing 1200 bps 2-meter packet from my home in Guilford, CT. I had a nice little setup with a toaster-style Macintosh, a KAM+, and a 10-20 Watt transmitter (Handytalky with an amp.). It would do the usual packet thing -- access local BBSs, digipeaters, etc. With a lot of effort, I could connect through RF gateways into New York or the Boston area. It was kind of fun sitting there and listening to each packet going out and (hopefully) returning. Not useful, by any means, but entertaining. There is a "Class A" network assignment for AMPRnet or "ampr.org" -- 44.0.0.0, or as we now say in CIDR terms, 44/8. That's a big deal. That is an allocation of 2**24 = 16,777,216 individual IP addresses, about 1/256 of the entire IPv4 address space, assigned to Amateur Radio. That's the same IPv4 address space that is supposed to be exhausted as soon as 2011. 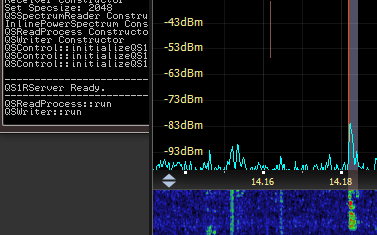 AMPRnet appears to be very lightly administered (and that's being polite) -- even for an amateur radio activity. The allocations are supposed to be managed by regional volunteers, but coverage seems spotty. The advertised coordinator for my area seems to be inactive now, so there is no one for me to even ask about my allocation! And, if you can get a number, it doesn't have much value, since no one can route packets to you unless you make "upstream" arrangements that are impractical for individuals. People seem to set up tunnels to a server at ucsd.edu, which probably works, but is hardly the way to build a big network! Traditional packet radio has been in long decline, except for special uses like APRS and DX spotting. Newer digital developments, such as DSTAR and HSMM use TCP/IP technology, since it's still the standard for computer networking, and they may use AMPRnet addresses. What about that 44/8 network? Is there any way, other than history, to justify maintaining that huge allocation in the face of a global IPv4 number shortage? I know of no simple way to find out which ones are allocated. I would be surprised if there were as many as 1,000 in use. Out of 16 million, it's a trivial number. The simple fact is that amateurs got a Class A allocation in 1992, when people weren't asking many questions and commercial use of the Internet was just beginning. We'd never get it today. We should ask why amateurs actually want any IP number assignments. Wouldn't we do just as well with a non-routable private network like 10/8? The vision that somehow a random Internet user needs to interact with a random Amateur Radio station is an odd one. If it involves RF transmission, only licensed operators are allowed -- although the status of server based systems like e-mail and the web may be unclear. It's 2010, and we have 20 years of Internet and ham radio development to look back on. Ham digital nets are fragmented and don't talk to each other much, let alone the Internet as a whole. Why do we need full routability between the RF world and the Internet? The Internet <--> ham model that is working is tunneling through the Internet to interconnect radio devices and computers. Echolink, IRLP, and DSTAR rely on this mode. No permanent ampr.org addresses are required. An RF-to-Internet gateway is generally at someone's house or place of work, where there is a standard Internet Service Provider connection. The gateway relies on the ISP's assigned address, just as we all do for domestic service. So maybe AMPRnet needs to be put to rest, giving its water back to the tribe. That would make a nice press release: Public-spirited amateur radio operators help the Internet put off catastrophe for 2 months! Or, maybe I'm missing something important. Let me know in the comments! Jeff, WA4ZKO, has some good comments here and here. 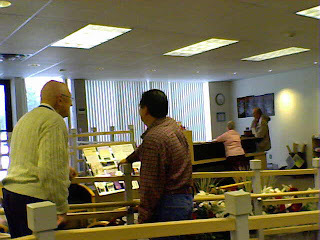 Here's the scene at the ARRL Headquarters lobby, as seen from the volunteer Tour Guides' nook. We are a lot busier today than normal, because of various committee meetings and other activities around the Board meeting this weekend. I've been a ham (amateur radio operator) now for 52 years, enjoying many facets of the hobby -- from Morse Code ("CW") to Open Source Software. In the past year, I've been volunteering at ARRL HQ, as a Tour Guide. Tour Guides are an interesting lot. They are generally retired folk, like me, who have a bit of time available and who have a long involvement in the hobby and a commitment to the League. I see most of them only rarely, since our slots don't overlap. (I have Thursday mornings, if you'd like to drop in.) The League's coordinator, Diane Petrilli, does know how to keep us motivated, with an occasional group lunch, and a certain amount of "swag". Along these lines, one the best benefits is a special discount at the ARRL bookstore. The real reason to be a Tour Guide, for me, is to meet a very interesting cross section of radio amateurs, along with spouses, friends, and family members. These are mostly "drop ins" who are visiting in the Newington CT area. Generally, they are long-time hams and League Members. Some of them are quite capable of giving me the tour -- and are happy to do so! On the other hand, there are a few who are just getting interested in the hobby and who need some encouragement which I'm happy to provide. Tour Guides provide an interface between the visiting public and the ARRL organization, so the flip side for us is having the chance to learn what's what at the League itself. Many hams, myself included, have grown up thinking of the ARRL Headquarters as something like the "mother church". The first visit here is like a pilgrimage to hallowed ground, the historic station W1AW, the editorial offices of the publications like QST, and home of many services for members. I haven't seen anyone kneel to kiss the ground yet, but you get the idea. Another good reason to hang out at HQ is the chance to operate W1AW. It's a thrill to be a "rare one" on the amateur shortwave bands. It's easy to create a "pile-up" of operators wanting to talk to this classic station. Just as interesting is the chance to use your choice of state-of-the-art radio equipment. It's one of the few ways to "try before you buy". Today, with the Board of Directors in town, there don't seem to be any normal visitors. A good time to meet some Directors, enjoy the Board's snacks and coffee, and pursue the Internet.